SMOKED LOW & SLOW. SERVED FRESH & FAST. House-made daily plus daily sides specials. Includes one side and a drink. BBQ for the crew fresh & fast at home, or at work. We are happy to pack up any menu item for take out or order from these convenient take home meals packages and feed a whole crew. Got questions, give us a call. Select convenient catering bundles or customize your BBQ function. From casual picnic style to full-service Alabama classy, Moe’s Original Bar B Que is a great choice for your gathering. Call (740) 920-9002 to book your catering or submit the form below. Ready for pick up in recyclable/ disposable pans. Delivered to your location and set up in recyclable/disposable pans. 20 person minimum. Delivered to your location with a buffet set up, professionally served, and post-event clean up. Pulled Pork, two sides, and buns or cornbread, plus BBQ sauce, pickles, plates, plastic ware, napkins, and serving utensils. Substitute Smoked Chicken or Turkey Breast for additional $2 p/person. Please submit your catering request by completing the form below. We will be in touch within 24 hours. 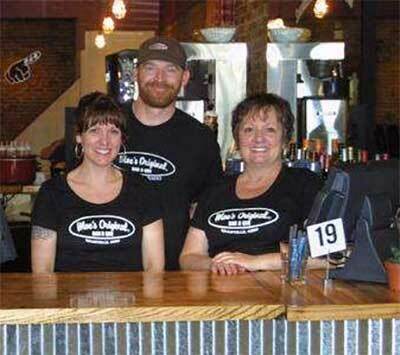 Owner/operators Kara Gallagher, Greg Tracey, and Nasie Gallagher have returned home to Licking County bringing with them Moe’s Original Bar B Que. Enjoy this comforting, fast-casual road house barbecue experience where great food is served fresh and fast in an atmosphere that is open, relaxed, spontaneous, and sometimes civilized. Place your order at the counter, find a seat (table sharing is part of the deal), and we’ll bring your order to you.